A toolkit to design multimedia projects. It uses Pure data extended programming environnment, and simplify its learning curve. Simply double click anywhere to show the pop-up menu and start patching! Just download and extract the folder Meandre2 to your desktop. - Avoid chinese caracters in files/folder's name. - Avoid space in files/folder's name (use - or _ instead). 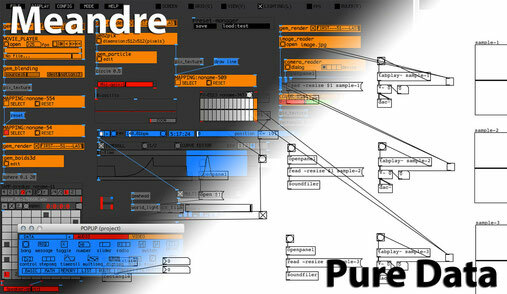 - Save your projects in the main folder: PureData_MEANDRE using File-> save as. - Video/image problem on windows? install quicktime. - 將你的檔案存在資料夾裡面： Meandre_2.1 using File-> save as.